A colour slide of the entry arch at Boldt Castle on Heart Island in the St. Lawrence River before the renovations. Boldt Castle is located on Heart Island near Alexandria Bay, New York on the St. Lawrence River. It was built in 1904 but was vacant for 73 years before the Thousand Islands Bridge Authority purchased the property. Renovations began on the castle in 1977. This picture was taken prior to the renovations. 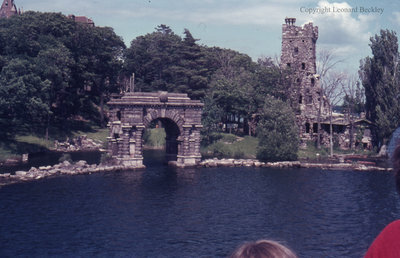 Entry Arch at Boldt Castle on the St. Lawrence River, June 1976, Leonard Beckley. Whitby Archives A2014_004_040.